The U.K. government has appointed Bank of Canada Governor Mark Carney to head the Bank of England, opting for an outsider as the British central bank confronts slowing growth and takes on a bigger supervisory role. Carney will continue to serve as head of the Canadian central bank until the end of May 2013. He will succeed Mervyn King at the Bank of England on July 1, 2013, U.K. finance minister George Osborne announced Monday. Osborne said Carney, 47, was being appointed for eight years but planned to serve for a maximum of five. He'll stand down in 2018 when his current term as chairman of the international Financial Stability Board -- set up in 2009 to strengthen global financial regulation -- is also due to end. In addition to setting interest rates and managing asset purchases under a £375 billion quantitative easing program, the Bank of England will get new regulatory powers next year, taking responsibility for supervising the country's banks from the Financial Services Authority and ensuring the stability of the financial system. "Mark Carney is the perfect candidate to take charge of the Bank as it takes on these vital new responsibilities," Osborne said. "He will bring strong leadership and a fresh new perspective. He has done a brilliant job for the Canadian economy as its central bank governor, avoiding big bailouts and securing growth." Carney, a Harvard and Oxford-educated economist who worked at Goldman Sachs (GS) for 13 years, joined the Bank of Canada as deputy governor in 2003. He left to work for the Canadian finance ministry in 2004 before returning to the bank as governor in 2008. 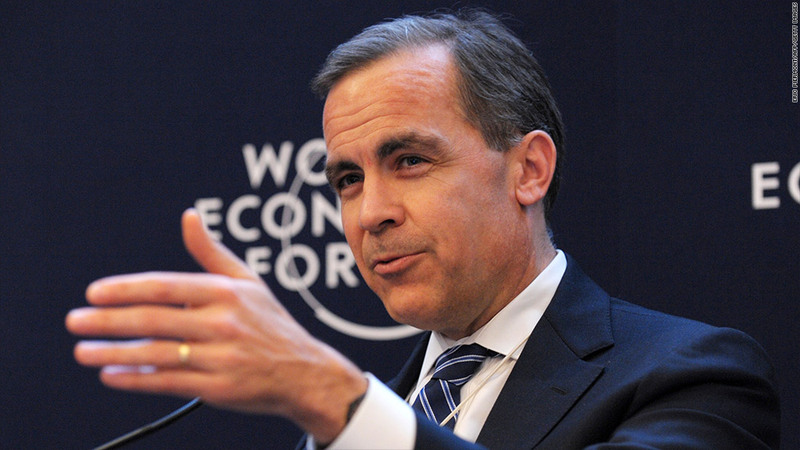 "I am honored to accept this important and demanding role, and to succeed Sir Mervyn King with whom I have worked closely over these past five years and from whom I learned so much," Carney said in a statement. "This is a critical time for the British, European and global economies; a decisive period for reform of the global financial system including its leading financial center, the City of London; and a crucial point in the Bank of England's history as it accepts vital new responsibilities," he added. The decision to appoint Carney, the first foreigner to serve as governor, surprised many Bank of England watchers. Paul Tucker, deputy governor at the Bank of England, was odds-on favorite with the bookmakers to succeed King. Philip Rush, U.K. economist at Nomura, said Carney's experience as a former co-head of sovereign risk at Goldman Sachs could prove invaluable in dealing with the fallout from the eurozone debt crisis. His appointment could also herald a change in culture at the central bank, although it was too early to tell what impact if any this would have on monetary policy. "At least for now, we take note of the relatively hawkish stance of the Bank of Canada, even though we believe he may have been toward the dovish side of that committee - no minutes or vote record are actually published," Rush said in a research note. Tucker's votes on interest rate policy had coincided with King's since June 2007, and they had voted together 43 out of 45 months on asset purchases since the bank began its QE program in March 2009. But the deputy governor was drawn into the Libor-fixing scandal earlier this year, after an e-mail from former Barclays CEO Bob Diamond was interpreted by some to suggest he had approved of the bank's attempts to make it look stronger than it was as the financial crisis raged in 2008. Barclays' role in manipulating the London Interbank Borrowed Rate, used as a basis for $10 trillion in loans worldwide, cost Barclays a fine of $453 million and Diamond his job. Tucker, appearing before a parliamentary committee in July, repeatedly denied any knowledge of rate fixing, rejected suggestions he had come under political pressure, and said he had spoken to Diamond to express his concern about Barclays' funding costs.